One thing that we all do is worry. Circumstances of want and necessity fill our lives and we sometimes we cannot see how we are going to make it. We instinctively according to our faith look to God, may times however doubting, unsure that He’ll really come through. Life is sometimes unkind and there are many living in despondence and despair. There are many with hearts that are broken, with dreams that are shattered, and with needs so heavy that they are burdened down to a point that they believe is beyond all hope and they have no thankfulness in the hearts. We must always remember that God is faithful. No matter if we feel discouraged or disheartened we must embrace the truth of God’s faithfulness. If we focus on our problems and troubles instead of God’s faithfulness, we are heading down the dangerous highway that leads to discouragement and unbelief. We must trust Him and know that he is faithful to us His children. He will Take care of us. As we trust, we must be able distinguish between what is a need, and what is a desire. Many times small children want many a thing they do not need. It is the wisdom of the parent which supplies the needs of the child. The same is true of us, God’s children – we often want things which would bring injury to our lives. God does not promise here that He will supply all our desires or wishes, but He promises that He will supply, and fulfill all our needs. Some may read these words and think they need new pretty toys for their lives and pray for frivolous items while others seek God in earnest for guidance; for strength against temptation, for happiness in a marriage, or the need for employment. Sadly, many people still make this foolish exchange with desires for needs, surrendering spiritual wealth, while seeking financial fatness. If we seek God in earnest with our hearts and minds stayed on Him we can be encouraged, and comforted that our God will supply all our needs. Let me break down Philippians 4:19 piece by piece for you. My God — God is the name of our banker, our supplier, our depot of blessings and reserve. He is our God and we are His children. Shall supply — There is the promise to pay here. Here is the statement, and the guarantee that He will supply and give to us without condition, recourse or stipulation. All your needs — He withholds no good thing from us. When we find ourselves in circumstances of necessity, we have a note or an IOU if you will, in His word that He will supply our needs — He is the value of that note. According to His riches — The IOU, the note- promise that we have in His Word is redeemed at the bank of God. His richness and vast supply is the capital of the bank that pays the note, according to His infinite and inexhaustible supply. God’s supply is according to His mercy — not of our debt, but according to His grace; not of our emptiness, but according to His fullness; not out of our poverty, but according to His wealth. In glory – In glory is where the bank that pays the note is located. It is in Heaven where God abides. He reigns in the heavenly sphere, where His attributes and power are in continuous manifestation, emanating from His throne. It was from glory that He created the heavens and the earth, and where grace was conceived. By Christ Jesus – Christ Jesus is the most important part of this verse. He is the signature at the bottom of the note that guarantees the payment to supply all our needs. He is the signature at the bottom of the check of redemption and need. He is the guarantor of the IOU and without Him the guarantee is worthless and has no redeeming value. 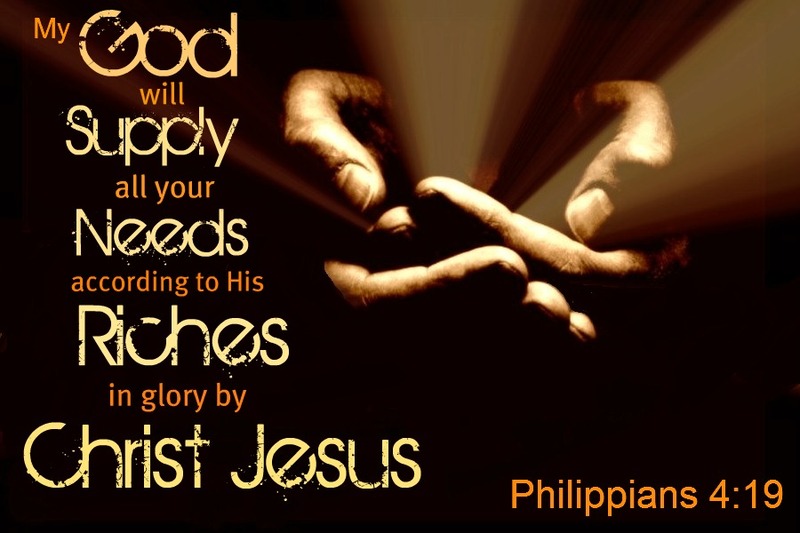 But my God shall supply all your needs according to his riches in glory by Christ Jesus. His is a perfect supply for every want of body or soul, for all time and for eternity, for earth and for heaven. May all the gifts and benefits that come from God our Father, and the Master, Jesus Christ, be yours. I thank God for your lives of free and open access to God, given by Jesus. There’s no end to what has happened in you—it’s beyond speech, beyond knowledge. The evidence of Christ has been clearly verified in your lives. Just love the way you broke down the verse!! Thank you Darrell for another uplifting message. I just finished editing a section in my memoir when I gave up on God at the age of eight – I didn’t know HIm as my parents weren’t church goers, they were abusive alcoholics. After a class in school where I realized I was the only one not attending church, I decided I would pray to God, so I got the pose (kneel by side of bed – hands folded just so) and asked God on three separate occasions, refining my prayer – make my father stop doing those things to me and make him love me, kill my father, kill me – in my mind God didn’t answer any of those prayers, the abuse continued. I am glad he didn’t answer prayers two and three. I turned my back on God and didn’t approach him for forty years – choosing instead the occult and new age – no help their either. Now, as healed and knowing the love of the Father, I do see how God answered my prayers – it was in the nots – what did not happen. I didn’t get pregnant, go insane, etc. And God was there in ways that I didn’t recognize at the time – such as in my fantasy parent dreams. Sometimes we forget that God supplies our NEEDS, not our wants. And sometimes we are looking for him to answer one way and he has a spectacular other way to answer. Have a blessed day. Great post, thank you for your dedication to teach the Word. Very encouraging. Thank you ! wow, iv’e always seen writers, breaking down verses, or trying to really translate the message behind the scripture. But as soon as i started reading this i was super amazed by the word usage he was using. It really seemed to touch me and allow me to fully understand the meaning behind the message. I’m realy touched by the way you broke the words into pieces.I’m a student and sometimes find it difficult to get money to pay my fees.I wanted some inspirational message from God, that realy He can help and i got to find yours.thanks sir.Ive now realized that ,God is my bank and i also have an IOU with Jesus who will always append his signature for me to withdraw all my needs. that is not right I need new cymbals and i am on disability why does god not supply my need, I play at church on the worship team I need the cymbals for that why does god not provide. God knows everything so I am glad as we stay obedient He will do all in His power to keep our foot from slipping and bless us as He sees best. I’ve been a minister 6years and ALWAYS needed That verse broke down and you’ve given my spirit onsite AND understanding. Thank you. Thanks Darrell for the encouraging write-up. May God help us to desire what He desires for us. Thanks For the teaching. It’s very great encouragement. separating need and desire, good one.